For the sake of context, I should probably begin by describing my experiences at the big gym that I joined. XSport fitness is a 24-hour one-stop fitness shop. 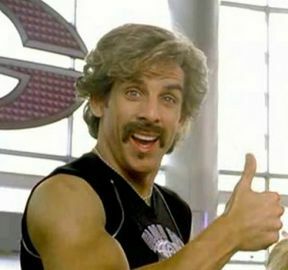 Crossfitters call gyms “boxes” and the large gyms “big boxes”, or more disdainfully, “Globo-gym” (after the hilarious depiction of Ben Stiller’s gym in the movie Dodgeball). As you walk into XSport, you realize that this gym has been designed to anticipate and meet your needs. Want to pump iron? We’ve got every kind of machine imaginable. Want to swim? We’ve got a salt-water pool. Want to ball? We’ve got a court with six hoops. Want to be outdoorsy? We’ve got a climbing wall where you can self-belay. Want to just hang out? We’ve got an Internet cafe that serves “healthy” recovery shakes. Got kids? We’ve got a daycare. Need to clean up? We’ve got showers, a sauna and as many towels as you could want. There’s not even a need to miss your favorite shows: we have 300 televisions, since every treadmill, elliptical, rowing machine and stair-master has a personal flatscreen. Upon further examination, however, you begin to wonder if this is actually the case. The base price to join the gym is low ($35/month), but there are all kinds of extras to add on if you need them (and you need them). They work hard to get you involved in their programs that increase their sales: personal training, tanning, massage therapy. They give you a “free fitness evaluation” which is designed to show you how out of shape you are before recommending 20-150 sessions at $50-80 each. They push hard to get you to buy the PT sessions, buy supplements and an expensive heart rate monitor. Not wanting to be killed any more than he was already killing me, I didn’t go anywhere near the food. But it made me think that maybe this gym didn’t care as much about my fitness as my money. They are less concerned with building my body and more concerned with building their brand. XSport is like a mega-church for fitness. 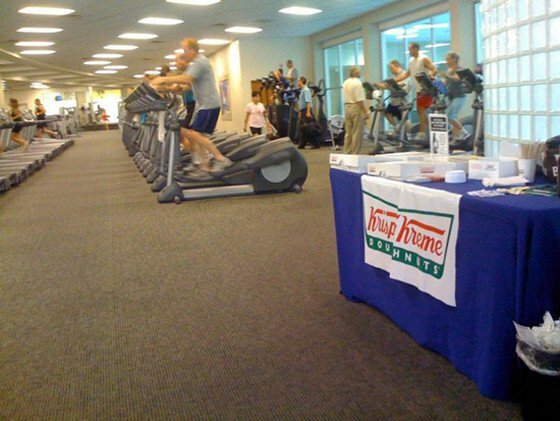 It is a gym built with the consumer in mind. It begins by asking, “what do the people want?” rather than “what do the people need?” There is a huge difference between the two. In the world of fitness, people wants options: they wants to feel good about working out without paying too much of a physical price. But what most people need is a program that will actually challenge them and force them to get healthy and fit. We need truth, discipline, and purpose, not coddling and Krispy Kreme. In the larger world the same is true. We want comfortable self-help with lots of options. We want results without paying the price. But we need something far more painful. We actually need to change. Question: Any stories about joining a gym? This entry was posted in Church of CrossFit, Fitness and tagged Church, Crossfit, Culture, Theology by Justin. Bookmark the permalink. My story about joining a gym: I don’t remember what it was but I got some kind of deal if I went so many times a week for 3 months. Their thinking was that after 3 months of regular attendance it would be habit forming. The day after the end of the 3rd month, I stopped going. My excuses for not going anymore…I HATE working out in a gym setting. I think it’s the most boring thing in the world. I wanted to get in and get out. I’m a very extroverted person, but don’t talk to me at the gym, I am not there to socialize, I’m there to get it done. If you want to talk to me, lets go for coffee. Jen: I think working out alone is incredibly boring as well, but I love working out with people, pushing each other, chatting, sharing life. That’s one of the reasons why the Crossfit gym was so appealing to me. I do think that the big box gyms tend to isolate people from each other. With so many options, so much customization, everyone just does their own thing! I think this is a fault of the megachurch as well. Boy did you read my mind? Thought that all along — corporate really doesn’t care about the health of your body, just the health of yoru billfold. It is more about reducing that than building up the body. Then show up and watch the people “working out” — lot of I am here to show you me than to improve me. Sounds so much like what George Barna labels “casual Christians,” when the Lord of the Church is looking for “Captive Disciples.” American churches are much more like Applebees, — looking good in the neighborhood and bringing you feel good religion. Which in the end is really a new Law that says you can do it yourself — look like you are working out, wear the right stuff, show up and it will be O.K. Time to think about the One who fit himself on the cross and then said, “Anyone who wants to follow me, should take up their cross.” As my hero of the faith, Dietrich Bonhoffer says, “that is the call to come and die” — die to self and live to Christ. To be the new person that says no to self and yes to God. I am all for getting rid of big box gyms and churches. Thanks for the comment! I’m actually inclined more graciously towards the megachurch than the big box gym, since the latter is almost pure consumerism and the former is something pure polluted by consumerism. For me, the size of a church is not the point as much as the values it embodies. Consumerism is so much a part of our society that it can’t help but be a part of our churches, and you get to see it more prominently in the big churches. I love Bonhoffer as well, as much as you can love someone who echoes Christ’s calls to come and die (or personal trainers who kill you so that you can find new life)!